The Italian boatyard Perini Navi, involved in the production of exclusive pleasure sailing boats for demanding owners from all over the world, is characterised by the exclusivity of its yachts, created with the obvious intention of speed and comfort. The impressiveness of the upper works, with their elegant yet modern, streamlined profiles, give these super-yachts unmistakable character, true admirals of the seas. Over the years this Viareggio based yard has given to the waters important creations full of appeal such as the 37 metre "Salperton", the 64 metre "Felicità West", "Squall", "Thesis", "...Is a Rose" and many other yachts with unequivocal style, the signature of Perini Navi. With the acquisition of the Becconcini Boatyards in La Spezia, a new shed in Viareggio and a new boatyard in Turkey, Perini Navi has increased its production, maintenance and repair capacity and has renewed the Mast Division. Thanks to these new structures, the yard's production has gained considerable benefit and they are already at work on a 43 metre, a series of 56 metre boats, a new 54 metre in collaboration with the famous architect Ron Holland and an unprecedented 88 metre boat. The latter will be presented towards the middle of 2005 as the flagship of the Perini fleet and will be delivered to its owner during the first months of 2006. This clipper goes by the name of "Maltese Falcon", for which Perini Navi has developed innovative technical solutions, thanks to which it is possible to raise modern square sails on its impressive carbon fibre masts, obtaining good performance at any speed. The appeal of this no longer used rigging is a unique characteristic of this modern clipper, which despite its appearance will be kitted out with technological rotating masts and new generation Doyle sails, while the interiors are designed in a contemporary style and have been entrusted to the German company Sinnex. Naval architecture studies and hydrodynamic and aerodynamic tests are to be carried out by the Gerard Dijkstra workshop, while external and interior design is by the Ken Freivokh one. 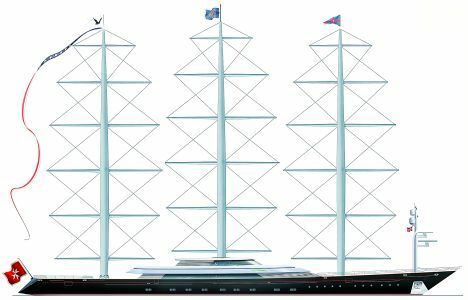 As the "Maltese Falcon" is still at the design stage, the boatyard has not yet released any plans for her four decks, preferring not to say too much at this point about the interior design and living quarters. For further information: Perini Navi; via Coppino 114; 55049 Viareggio; Italia; tel. +39 0584 4241; fax +39 0584 424200; website www.perininavi.it; e mail info@perininavi.it.